Tell me,wise Native person,is my garment discheveled according to your customs? SASKATCHEWAN, shot out of the shoot-chute in 1954, is a Northwestern, filmed in Alberta, in the gorgeous mountains about Banff National Park, not in the flat lands of the neighboring province the film is christened after. Why should geography get in the way of a typical mid 50s Saturday action matinee anymore than historical accuracy? 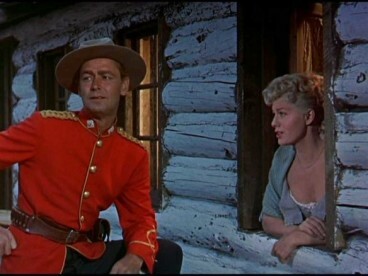 Alan Ladd mounties up, in the style of bright red tunic that was not used in 1877, when the action alleged here did not take place. Shelley Winters (spare us) goes low-cut like we bet the gals did back then. J.Carrol Naish pulls another accent variation out of his repertoire– French-Canadian this time. Hugh O’Brian, Richard Long and Jay Silverheels are on hand: if you know your TV, boomers, that would be Wyatt Earp, Jarrod Barkley and Tonto,respectively. Raoul Walsh directed. The scenery is nice. It came in 51st in the US during its release year, with worldwide totals bringing it up to a rowdy $6,430,000. With Robert Douglas, Antonio Moreno and Anthony Caruso. 87 minutes. Also known as O’Rourke Of The Royal Mounted, they could just have well have titled this Succotash.